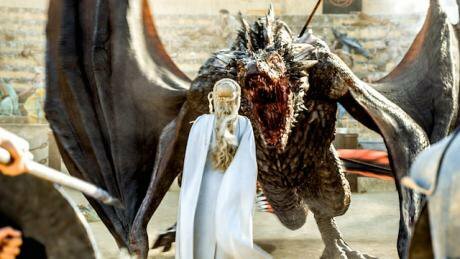 Game of Thrones:"The fight between Rhaenyra Targaryen and her half-brother Aegon for control over the Seven Kingdoms. Both of them thought they belonged on the Iron Throne. When people started declaring for one of them or the other, their fight divided the kingdoms in two. Brothers fought brothers, dragons fought dragons. By the time it was over, thousands were dead. And it was a disaster for the Targaryens as well. They never truly recovered." As social media platforms like Facebook grow, so the old institutions of the public sphere are withering. Those which survive seem to have no option but to do business with the dominant platforms, which only increases those platforms’ power to shape our discourse. Habermas saw the public sphere as a virtual space in which private citizens come together to hold their governments to account. The mass media had a role in this, along with civil society organisations such as trade unions and NGOs. Together, these institutions shared information and ideas and created forums in which people found their collective voice. For many people today, those old institutions are irrelevant. They do not buy newspapers. They do not belong to trade unions or political parties. Their public sphere is Facebook, and Facebook alone. This is where they get their political information; where they buy and sell goods; where they form relationships and pressure groups. The twentieth-century public sphere was far from perfect. It was geared towards the interests of the élites which owned the mass media companies, controlled the advertising market and led our political parties. There are many ways in which the new public sphere is preferable. It has allowed previously-excluded groups, such as trans people, to assert themselves, for example. And it has given us, as citizens and consumers, powerful new tools for speaking truth to power. However, recent reports on openDemocracy and elsewhere have shown that the new public sphere is open to abuse of a new kind. Platform users may in fact be unwitting pawns in a global game of thrones, where political campaigns in one country are funded by dark money from another; and so-called ‘grass roots’ movements turn out to have been planted by political or corporate actors. Fake news is just a part of this. Other challenges include junk science, where corporations are able to manipulate social media algorithms to spread disinformation about man-made climate change or the link between smoking and cancer; and hate speech, where well-organised social media campaigns are used to push certain voices (particularly feminist voices) out of the new public sphere. What can we do about this? How can we shape a twenty-first-century public sphere which combines the best of the new (free expression; peer sharing; user communities) with the best of the old (democratic accountability; public service; trustworthy institutions)? Until recently, the answer has been clear and unambiguous: we can do nothing. Facebook, like most social media giants, is a US company. To the extent that it is a platform for free expression, it is protected by the First Amendment. It resists government intervention like a hedgehog resists being picked up. At the same time, Facebook is also a global corporation, working across national boundaries. National governments have struggled to pin domestic laws and regulations on it. Where governments or citizens have tried to impose legal obligations on social media companies through the courts, they have faced another challenge. Platforms are not responsible for commissioning the content on their sites. Therefore, they have argued, they should not be held liable for it (although they should, it seems, be free to profit from the data that their users give them for free). Should we throw our hands up in the air? Should we conclude that global expression platforms are beyond regulation, simply because they are global expression platforms? I don’t think that is good enough. And I think the tide is turning. Even in the US, Facebook is now coming under growing pressure to take its responsibilities seriously. However, it is clear that our regulatory framework was not designed with social media platforms in mind. In the late twentieth century, the European public sphere was protected by a range of interlocking laws and regulations. These applied fairly discretely to different kinds of entity, from broadcasters and newspaper publishers to advertisers and political parties. Social media platforms make a nonsense of these old categories. For too long, we have looked at the social media platforms as a problem for media regulation. But they pose just as great a challenge for advertising regulation and electoral law. We urgently need a new regulatory settlement that can address the multiple challenges the social media economy poses to the public sphere. This settlement should be grounded in the interests of the public, not the business model of the platforms or the desire of governments to seek control. This new regulatory settlement should address the needs of the public in all our guises: as voters, who want to make democratic decisions based on accurate information; as citizens, who want to engage freely in the public sphere; as consumers, who do not want to be misled by false advertising; and as individuals, who deserve to be treated with dignity. It should recognise the positive contribution that platforms can make to the public sphere. But it should not be naïve enough to believe that platforms can – or should – be left to define the public sphere on their own terms, any more than advertisers should, news publishers or political parties. There are currently too many incentives for platforms to sell our data, and our attention, to third parties, and not enough incentives for them to put the public interest first. The old public sphere is broken and the new one is riddled with flaws. But the ideal is still valid. We should seize on our current challenges as an opportunity to redefine the public sphere for this new era, setting out the rules which will allow it to thrive.